Make it Real. Make it Relevant. Make an Impact. Watch the Mission Possible video. Read More in our 3 Year Report. 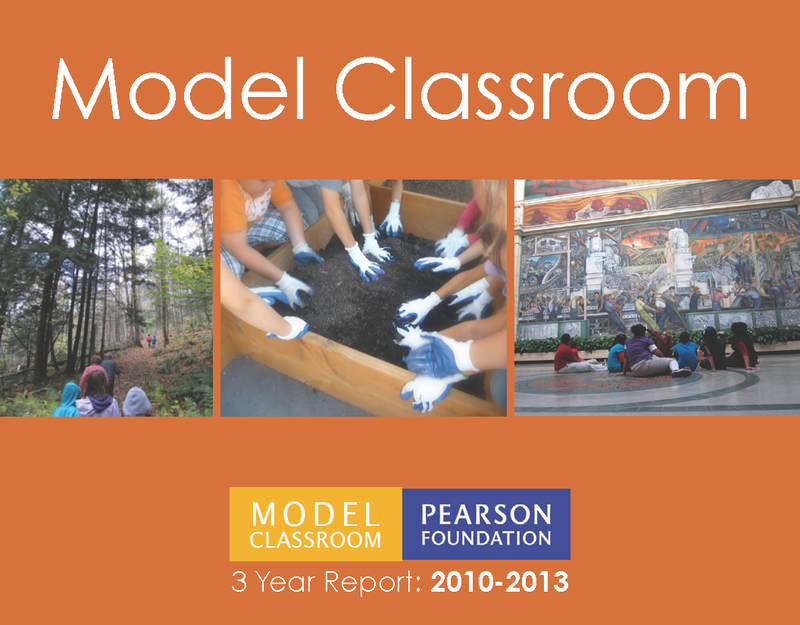 Model Classroom was a three year program sponsored by the New Learning Institute, a project of the Pearson Foundation. As a community of educators, Model Classroom supported teachers in developing strategies to extend and recognize the learning that takes place outside the classroom, encouraging educators to ask students to be creative problem solvers, sensibly deploy digital media, and embrace civic engagement as a pathway to becoming ingenious and resourceful 21st century learners. Over 400 teachers participated in professional development workshops led by Model Classroom, and over 50 student projects were implemented through the program. Professional Development Model: During a Model Classroom workshop teachers participated in a set of missions that took them out into the community so that they could experience the firsthand excitement of discovering opportunities for learning - much like their students would. Teachers were invited to carefully examine and describe their own teaching practice, then consider how that practice would change if their students were required to identify and develop solutions to authentic problems in their communities. What resources would they bring to bear? Would they partner with community organizations or experts? How would they incorporate today’s digital technologies and social networks? How would they use the greater context of addressing these real world problems to cultivate critical thinking habits as well as reinforce reading, math and other fundamental skills? Project Support: Unlike other professional development, the Model Classroom program encouraged educators to continue to work and communicate with the New Learning Institute. NLI provided program support, documentation and shared the best practices that educators developed while implementing their projects. Tiffany McGettigan initiated the Model Classroom Program based on the need to support teachers implementing project-based learning. As a program manager Tiffany designed professional development workshops and long-term programs, developed planning tools and resources to support project implementation, and facilitated project planning conversations with classroom educators. Tiffany enjoys the challenge of helping educators embrace student-driven and project-based approaches. She’s most proud of her work designing ongoing Professional Development for teachers in coastal Oregon and the D33 workshop, a program that transformed a classroom project into a workshop challenging teachers to find opportunities for their students to take action on issues in Detroit. Brian Burnett worked with the Pearson Foundation 2006 to 2014 as a project lead for many New Learning Institute digital media programs designing, facilitating and supporting student-centered, problem-based learning programs that integrate technology into the classroom in real and relevant ways. Some of Brian’s key projects include Cathy Davis Hayes’ cross-curricular Cultural Vibrations project, Chris Poulos’ Museo del Barrio project, Donna Dubois’ Eugene Oregon Historical Project, Elizabeth Firnkes’ interfaith Middletopia project, and the Detroit 1933-2033 summer PD workshops. He gained a new appreciation and understanding working with educators around the country, experiencing first hand the challenges they face every day, their creativity and passion they invest for the well-being of their students. Jane Drozd worked as a Digital Media Specialist for the Pearson Foundation’s New Learning Institute (NLI). In this role Jane supported teachers and teens in planning and implementing projects both inside and outside of the classroom and provided design for documenting and sharing their work. As part of the Model Classroom, Jane created and maintained the Model Classroom website, designed the three year report and supported many projects between 2011 to 2013. Some of her favorite moments include visiting rural Wyoming to work with students on creating art from their neighborhood trash pick-up which inspired a campus-wide recycling program and supporting teachers in Kansas who designed a project to engage and motivate students to read and write purposefully. The Project MASH Problem-based Learning Toolkit is based on the Model Classroom approach: Make it Real, Make it Relevant, Make an Impact. Follow us on Pinterest for a wide range of teaching resources.